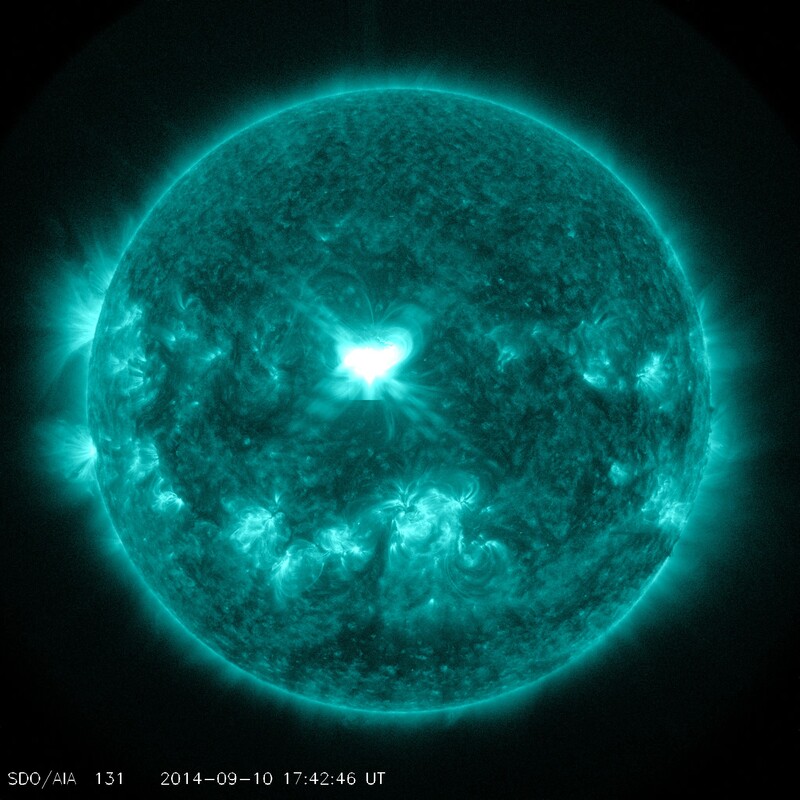 Geoeffective Sunspot 2158 produced a strong solar flare this afternoon (Sept. 10) measuring X1.6 at 17:45 UTC. The event was associated with a Type II radio emission with an impressive estimated velocity of 3750 km/s. 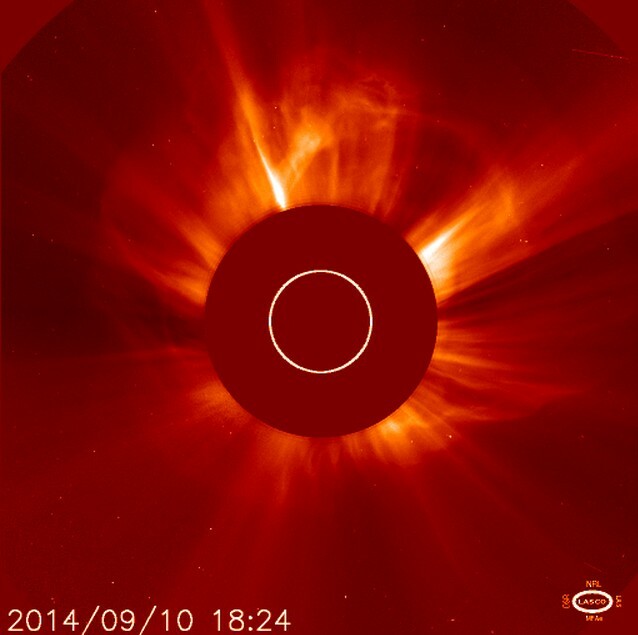 Coronagraph imagery shows a full halo coronal mass ejection (CME) that is Earth directed. The plasma cloud is expected to sweep past Earth on Friday and could lead to minor to major geomagnetic storming at middle to high latitudes. Proton levels streaming past Earth reached past the minor (S1) radiation storm threshold following the event. A moderate G2 level geomagnetic storm is now in progress. The solar wind speed is currently at 607 km/s and the Bz component of the interplanetary magnetic field is currently pointing north, a condition that is know to suppress geomagnetic activity. With any luck, the Bz will drop south over the next several hours. More to follow. Energetc proton levels following the CME impact spiked to just above the moderate (S2) radiation storm threshold. The anticipated coronal mass ejection (CME) generated by the X1.6 solar flare on September 10th swept past Earth at 15:55 UTC. Solar Wind speeds as measured by the ACE spacecraft increased from 433.2 km/s, to 671.8 km/s. A Geomagnetic Sudden Impulse measuring 43 nT was detected by the ground based magnetometer in Boulder, Colorado. Increased geomagnetic activity, possibly reaching storm levels, will be possible in the hours ahead. 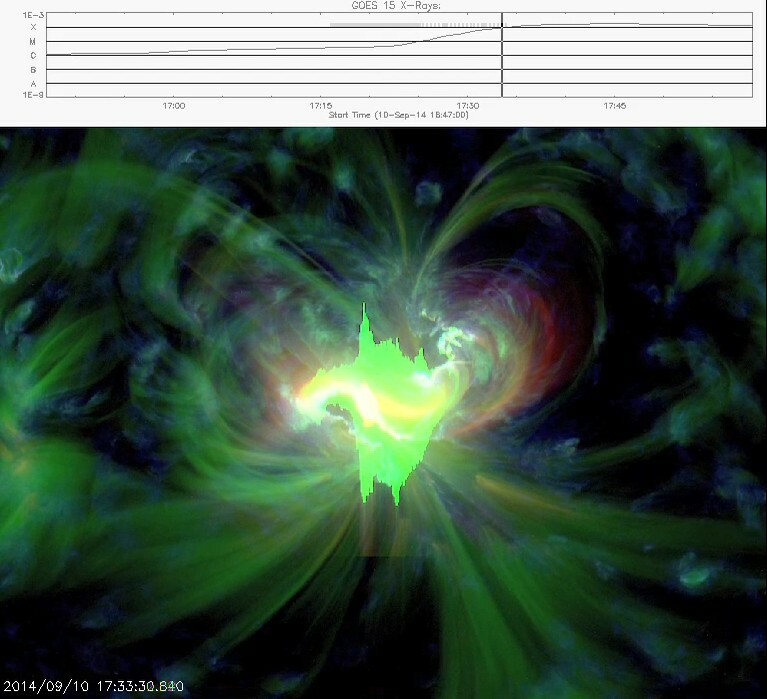 The anticipated coronal mass ejection (CME) generated by the X1.6 solar flare on September 10th is now reaching the ACE spacecraft (Sept 12 @ 15:30 UTC). Solar Wind speeds increased from 433.2 km/s, to near 671.8 km/s. It will likely reach Earth within the next hour. Stay tuned for more updates. An updated CME prediction model released by the NOAA Space Weather Prediction Center is calling for the plasma cloud generated by the X1.6 solar flare to impact our geomagnetic field by Friday. A moderate to major (G3) geomagnetic storm watch is now in effect. Solar wind speeds are predicted to reach near 800 km/s and could add fuel to another geomagnetic disturbance already in the forecast resulting from an earlier M4.5 flare and CME event. Sky watchers at middle to high latitudes should be alert this weekend for visual aurora displays. As expected, proton levels continue to rise and is now above the minor (S1) radiation storm threshold. Attached is updated video by LASCO C2 and C3 showing a full-halo coronal mass ejection (CME) leaving the sun following a major X1.6 solar flare on Wednesday afternoon. Based on this video, the quick moving plasma cloud is directed towards our planet. Low and high energy proton levels streaming past our planet are currently on the rise. Watches are now out for a solar radiation storm to take place and this could affect things such as high altitude travel and Earth orbiting satellites. Once the plasma cloud reaches Earth, possibly by as early as Friday, minor to major geomagnetic storming will be possible. 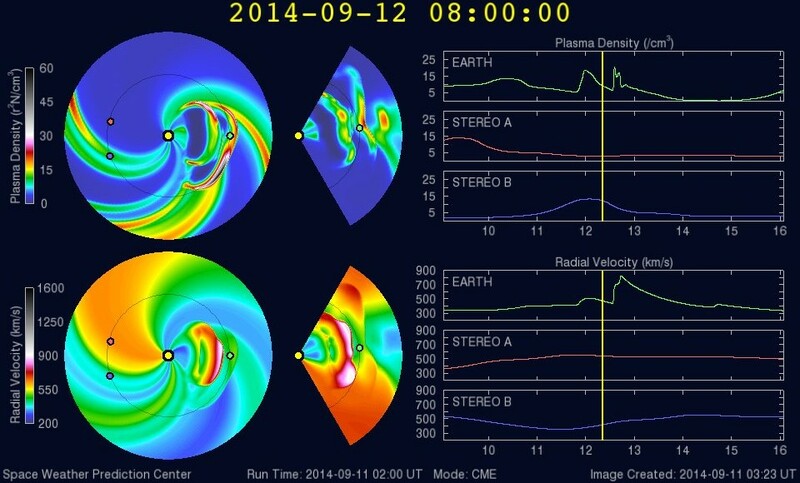 This event could interact with an earlier slower moving CME following the M4.5 event from Sept. 9. Sky watchers should remain alert this weekend for visual aurora displays. More updates to follow. 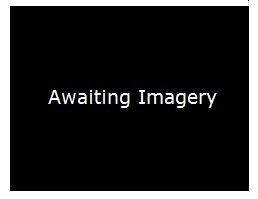 Coronagraph imagery is now being added. 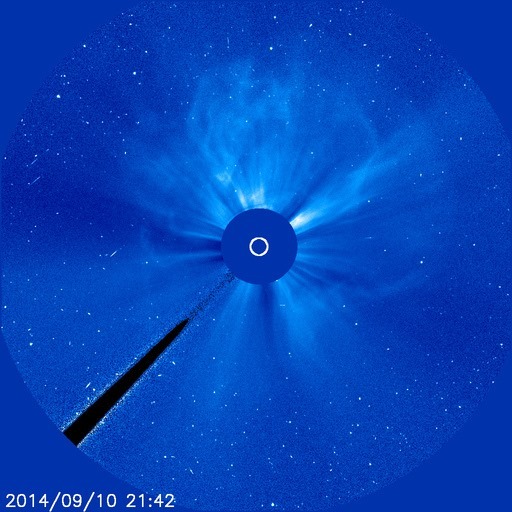 LASCO C3 is showing the wide swath of a coronal mass ejection (CME) following the X1.6 solar flare. Another update to follow once additional imagery comes in. 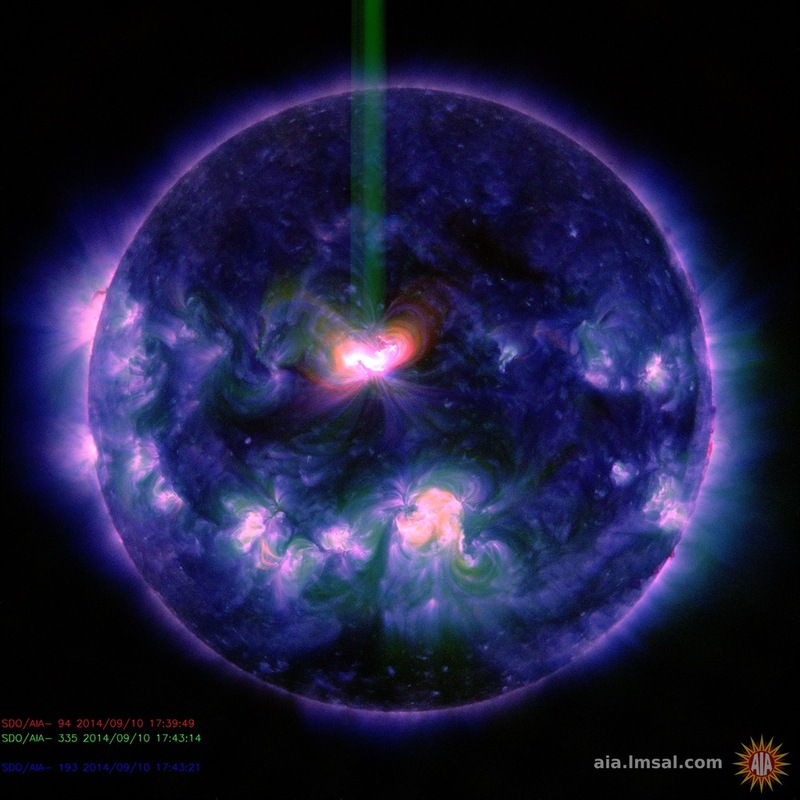 SolarHam video presentation of the X1.6 solar flare, complete with X-Ray and Global D-Layer data is now available. Incoming data reveals that the X1.6 event generated a 10cm radio burst (TenFlare) measuring 1300 solar flux units and lasing 57 minutes. While coronagraph imagery is still needed, other data suggests that the CME will be a large, full-halo and Earth directed event. 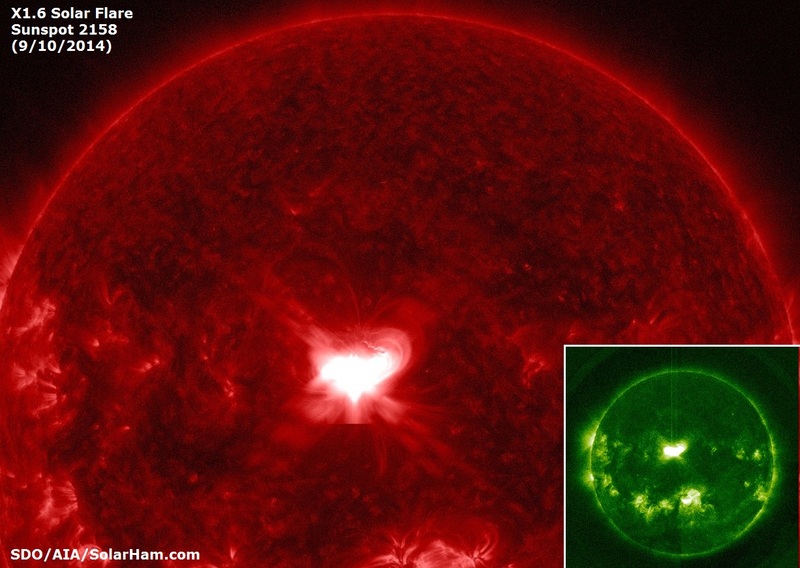 A geomagnetic storm will likely be possible by this weekend. More to follow. 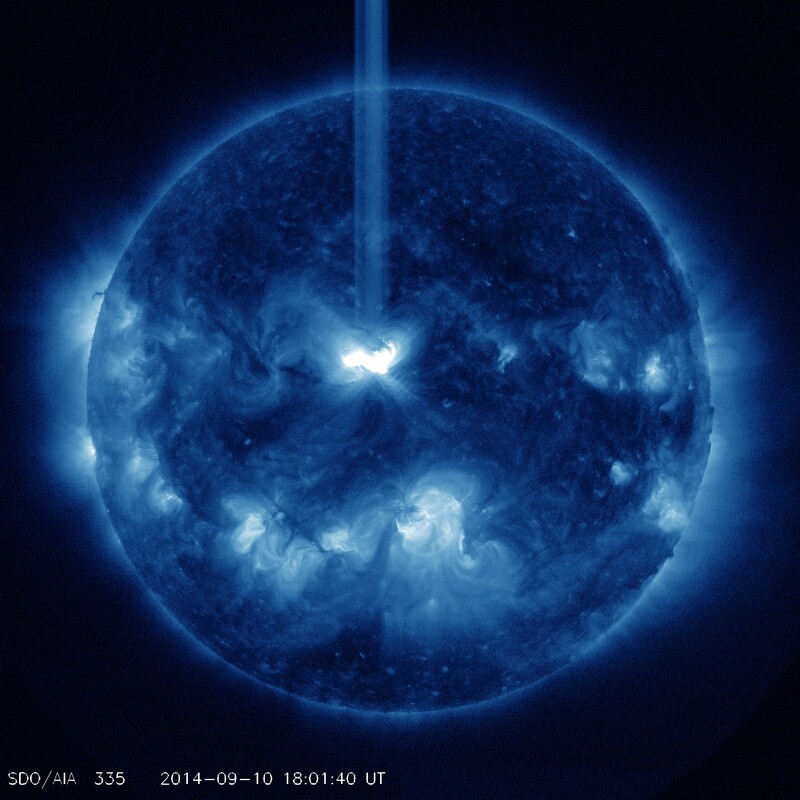 The flare event was associated with a Type II radio emission with an estimated velocity of 3750 km/s. Very rapid. 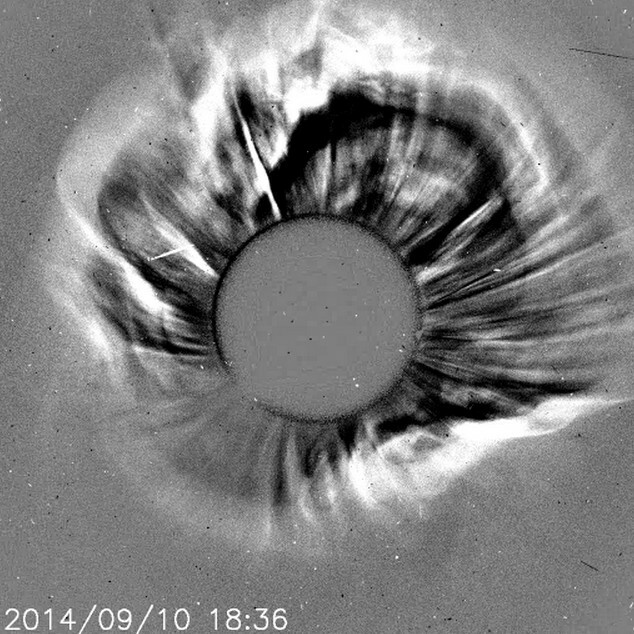 Updated imagery suggests a CME is indeed associated with the major flare. 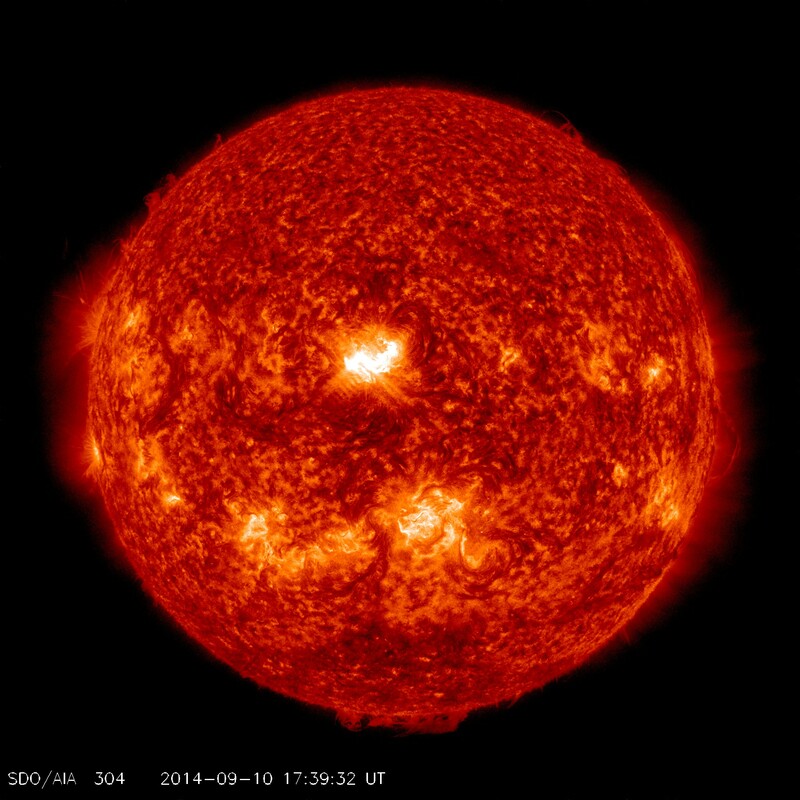 Geoeffective Sunspot 2158 produced a strong solar flare this afternoon (Sept. 10) measuring X1.6 at 17:45 UTC. Because the region is in a great position, if a coronal mass ejection (CME) is associated, it will likely be directed towards our planet. Stay Tuned.